Quick access menus and in-app alerts for due leads. This time we added two new menus to your navigation bar: Most recently called and Upcoming leads. We’ve had quite a few users ask for easier navigation back to the lead they just worked. 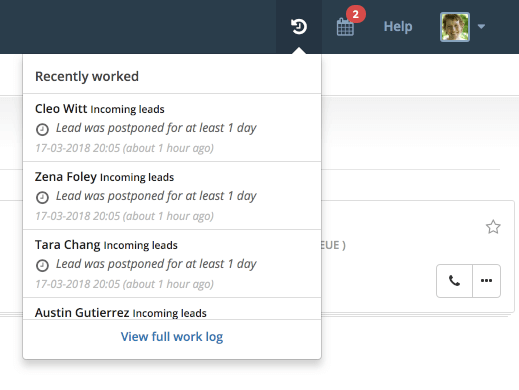 Likewise, a lot of you have been asking for in-app notifications of due leads, so that you would be notified even when not using the unified queue. With the two new quick access menus, you get all this and more. Most recently called leads viewed form the quick access menu. The new menu for recently called leads will show you the 6 most recent calls you had. It allows you to quickly go back to a recetly called lead, in case you forgot something or if they call back. In the bottom of the menu you can go to your full call log, if you need to explore further back the the most recent 6 leads. Upcoming leads viewed form the quick access menu. The new menu for upcoming leads features a badge that shows the number of currently dues leads. 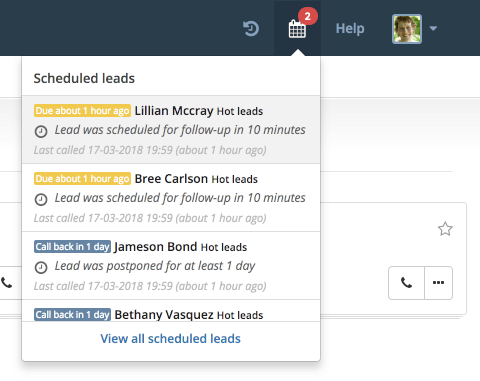 When you open the menu, the first 6 scheduled leads will show, allowing you to quickly select the next scheduled or postponed lead you need to call. In the bottom of the menu, you can go to your full schedule. We hope you like these new ways of easily navigating the most important parts of myphoner. As always, please do not hesitate to reach out with any feedback you might have. I'm an entrepreneur and web developer. I've built or helped build a handful of startups. I strongly believe in dedicated software that solves one task, but solves it really well. During my experience as an internet entrepreneur, I never found that software for cold calling, so that's why I decided to build myphoner. I'm very proud of what myphoner has become, and I'm dedicated to doing everything I can to make it stay a success. That's why I greet all new customers personally and always read and reply to the feedback I get. Yet another "Five steps to get started with cold calling"
Get myphoner from just $11.67 €10 per user per month for everything. No hidden fees. No limits. Add or remove users at any time, and pay as you go. Get emails about new features & future updates. Follow us on the social web to stay connected. We only post relevant material, and not too often.